Spring, summer, and fall are all allergy season for some unfortunate people who are allergic to pollen. In spring, it’s early-flowering, wind-pollinated trees. They release large amounts of pollen in hopes that a few grains will find their way to a waiting flower. Because they don’t need to attract insects, they are small and inconspicuous. In summer, the grasses take over — and people can be allergic to both grass and trees. In fall, it’s the weeds such as ragweed. Perhaps due to global warming, the ragweed season has lengthened by almost a month in Canada. You can read about pollen allergies here. It’s always good to remember that weather is both heartless and beautiful, to watch out for its vagaries and to enjoy its beauty. The Weather Network Gallery is a good place to browse through hundreds of beautiful images in several categories: scenes of the season, active weather, beautiful weather, animals, gardening, outdoor activities, and travel. The world would be a more boring place: we’d have no seasons, no spring and summer, no dead of winter, no dog days of summer, and no Yule celebrations. A man that convinced many others that he could use magic to bring a lottery win has been sentenced to a long term in prison. The Toronto Star devotes a few thousand words to this story, but I’ll confess I have very little sympathy for the victims. The one most prominently mentioned in the story had 105,000 CAD in free cash to spend on this jaw-droppingly stupid scam. The devil (for whom I’m not really sympathetic either; he deliberately fooled gullible people, preying on their mental weakness—evil) was not Bernie Madoff, preying on friendships and moving money around in a Ponzi scheme; this scam was transparently fake from the first words. Particularly interesting (to me) is how the writer of the Star article somehow treats the victims’ idiocy as a non-issue. Antibodies found in llamas are smaller and denser than ours and may be better at getting at receptor sites that the HIV binds to. Five antibodies against HIV, which work in vitro, have been identified. There’s still the problem that our antibodies may react against the llama antibodies. Read about the newly discovered llama antibodies. 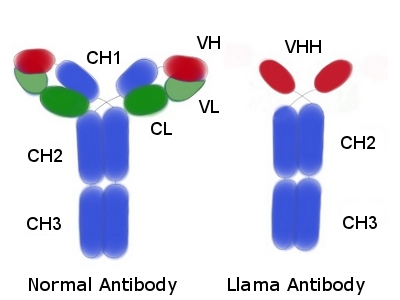 The image below compares a human antibody to a llama antibody. The first fossil showing the extent of the wing membranes of a pterosaur was found back in 1873. Ferris Jabr has posted a picture: pterosaur wings.